Who doesn't like getting more value than they expected? I know I do. 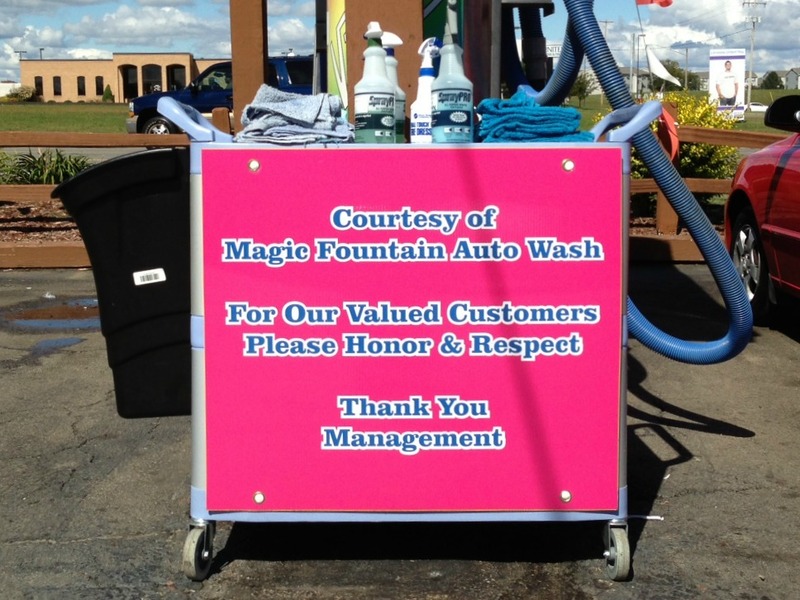 So, when I pulled into a local car wash this weekend, I was happy to see the cart (at left) near the vacuums. On top were spray bottles of glass cleaner and tire dressing, plus a couple stacks of clean rags. "Hey, cool," I thought. "My tires could use a thorough dressing!" And my windshield was in dire need of a cleaning. The folks at the car wash helped me get both tasks done at no extra cost and without having to make another stop. Nothing to write home about, I know, but I sure appreciated the gesture and the "little something extra." Think of a time when you got more than you were anticipating. Did it make you feel good about the business? Did you tell a friend about the place or share the good news on social media? Did you go back because of that added value? Now, think about what you or your company can do to generate that same positive vibe. Could you empower employees to give extra reward points "just because"? You might offer free shipping to any caller who places an order after being on hold. What about partnering with another business to give away samples of their products at your store, and vice versa? Could your company offer free workshops, training or how-to sessions? What if you thanked your best clients by delivering a catered lunch to their offices? Throw in some live music to boost the wow factor! There are all sorts of ways you can surprise, delight and provide more value to the people who keep you in business, and you don't have to break the bank to do it. When you give more, you'll make memorable impressions, differentiate your company, earn your customers' loyalty, and encourage good word of mouth. And isn't that what the best marketing is supposed to do?